This worksheet is modified from the middle school reading curriculum. 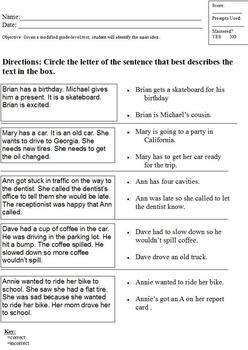 Students are asked to read the short paragraph and circle from a field of two which is the main idea. This enhances test-taking skills for students. For alternate ideas, have students use highlighters to highlight key words that help them identify the main idea. This is excellent for special education students who require an alternate or modified curriculum. It is also an excellent worksheet for general education students in the intermediate grades. It would be useful as homework, classwork, or even a warmup. Given a modified grade-level text, student will identify and/or explain the main idea.